East Iowa Bible Camp is a camp that God built – there can be no doubt about that. Its beginning and history are filled with drama and indisputable evidence of the power of a living God. It gives proof that God does hear and answer prayer! The story begins back when God planted the idea of a camp with the hearts and minds of two men. One was a young preacher – the other a farmer who was very dedicated to the Lord. Once that seed was planted, He arranged that these two should meet during the summer of 1943. “The preacher, feeling the need of a camp in nearby southeastern Iowa where young people might spend a short summer vacation in a wholesome Christian atmosphere and under competent spiritual leadership, approached the farmer and found in him a man who, because of a similar vision, has already bought a 40 acre tract of land which was dedicated to the Lord for this very purpose.” Can you imagine their joy when they discovered each other and how the Lord was preparing the way? That fall, a group of pastors and laymen who also had a burden for the Lord’s work among children and youth, came from the communities of Deep River, North English, Marengo, Tama, Iowa City, Cedar Rapids, Shellsburg, Columbus Junction, Sigourney and Sully and prayer meetings were held to seek God’s direction, his timing, and provision. As a Result, East Iowa Bible Conference was born as an interdenominational Bible camp where souls would be won for Christ, saints would be edified, and campers encouraged to dedicate their lives for Christian service. The preacher, Rev. Darrel Rhodes, was elected its first president and the farmer, Mr. Alfred Wyant became its Vice-President. Others chosen on the Executive Committee were Mr. E. Lester Elam, Secretary, and Rev. F.P. Pickets, Treasurer. The God-inspired vision was now beginning to become reality. It was found that the tract of land dedicated for a Bible camp was not suitable, inasmuch as it was a flat corn field. However, the leading of the Lord was very evident in the acquisition of a beautifully wooded tract of Virgil Grimm’s located in the rolling hills of Iowa County on the Diamond Trail between Deep River and Millersburg, Iowa. Faith rose to conquer fears when the scarcity of certain vital materials and the limited time of the volunteer workers caused to discouraging difficulties, but God provided. A large abandoned building was purchased in a nearby town, torn down, and the material was used in the building of the camp. Shingles were next to impossible to obtain during the War, however, a lumber yard manager at Montezuma found a supply that he agreed to sell to the camp. The work needed to be done that winter and “in spite of the ridicule of some doubters, warm weather was experienced just long enough to successfully lay the foundation of the main tabernacle building. The men worked diligently, and the miracle-working hand of God was clearly evident in the record mild winter He gave that year. God continued to provide in marvelous ways, “sometimes doing that which even astounded the most faithful and ardent workers in the camp and also sending his guardian angels to protect.” A charge of dynamite was set to blast a hole for the basement of the chapel. The men waited and waited and then waited some more, but it didn’t go off. They had just left their place of safety and taken a couple of steps towards it when the charge went off. A few minutes and steps more and it could have been a tragic story. First to go up was the main chapel-dining room building (now known as Founder’s Hall); next the dormitory building to house guest speakers. A shallow well was then drilled, and cabins were built. God saw that all the needs ranging from kitchenware, a piano, to offering plates were met, even though there were a few anxious moments. Bunks for the cabins had been purchased from Army Surplus, but there were no mattresses. They had tried everything, but there just weren’t any to be had. The situation seemed hopeless until at the last minute -(literally)- the day the camp opened, a truck came lumbering up the drive loaded with –(you guessed it)- mattresses: A mattress for each bunk. On July 4th, a dedication service was held at the camp with about 200 people in attendance. “There were many choked voices and wet eyes as the blessing of God were recounted.” The Anderson Monument Company of Cedar Rapids donated a stone inscribed with the words, “The Book, The Blood, The Blessed Hope,” the foundation on which East Iowa Bible Camp was forever to stand. It was set in place at the base of the flag pole. · In 1965 that campers had to be turned away last year even though a tent had been brought in. · 1973 – “Nearly 300 were served daily meals, taxing kitchen and dining facilities. Seating was in shifts to accommodate the large numbers. – An overflow audience attended evening services with some 100 or more persons seated in the yard while nearly 225 occupied chapel.” -Dr. Stanley Toussaint was the Bible teacher. · 1980 – “Campers have been registered from six states in recent years … coming from Minnesota, Michigan, Wisconsin, Illinois, Missouri, and Nebraska,” and even Oklahoma, Alabama, and Tennessee. A week at East Iowa is packed full of camp life such as games, contests and sports, together with Christian training given by teachers who know how to make the Bible a living book and missionaries from around the worked to challenge and instruct campers. In the 70’s, the youth camp attendance exploded. Rev. Marlin Rasmusson was Dean of the 5th & 6th grade camp and had a hard time recruiting enough counselors and finding a place for the 122 campers to sleep. The time had arrived to divide the camps so only one grade attended each week, except for the high school week. Two of the theme camps which became traditions for a number of years were “Cowboy Camp” and “Holiday Camp.” During the “Round-up for Jesus,” third graders became “Cowpokes for Christ” and under the direction of “Sheriff,” Mike Lawler and his “Deputy” wife, Kendra, they sang: “I’m just a cowboy, a Christian cowboy … I’ll live for Jesus all my days … And on the prairie or in the city … I’ll help him round up all the strays.” They spent mornings in chapel “round-up,” memorized “gold nugget” Bible verses during the week, and thanks to Ivan Archer of Nowalk, even got to ride horses. Through it all they learned to live for Jesus, and some of those campers are out there today “rounding up all the strays.” The Des Moines Register came and wrote a 2-page spread for the Sunday Picture edition. Holliday Camp, which became a tradition for 9 years, was where EIBC became a Holiday Haven and campers delved into their Bibles. The built snowmen, became reports for the Jerusalem Gazette, racing around Jerusalem from one area to another on their donkeys reporting on all the events taking place, went on Pilgrim Scavenger Hunts, at authentic food in authentic style from the country of the missionary, etc. Burdell & Charlotte Hensley (and the last year, Del and Marilyn Johnson) organized these weeks which doubled in number of campers from the first year with 62 till the last, A special 25th anniversary gift from the Lord to the Hensleys resulted in 25 campers coming to trust Christ as their Savior that year. Isn’t that just like Him? It’s interesting to note the changes and things that haven’t changed throughout the years. 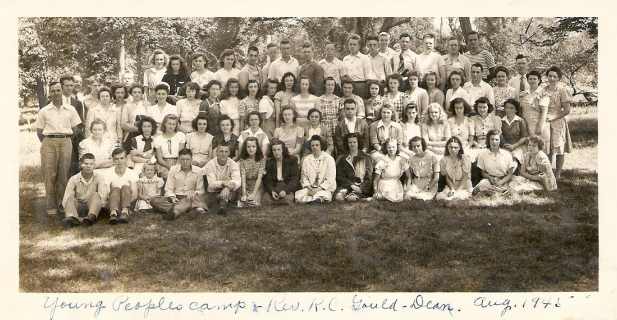 The summer of 1946 included a pastors’ retreat, boys and girls camps for youth 12 to 15 years old, a junior camp for those under 12, adult camp, youth camp for those 16 – 30 yrs. (you were a “youth” a lot longer then), and a men’s retreat. Cost for 10 days (Monday to Monday) was $7.50. In 1948, the cost had increased to $8.00. The daily schedule was much like it is today with classes during the forenoon, supervised recreation in the afternoon, vespers and campfire and evangelistic services in the evening. The pastors’ and men’s retreats had been dropped that year. In 1949, the cost had increased to $8.75. In 1960, the camps were based on the age of those attending and ranged from $10 for 8 & 9 year-olds, $12 for 10 & 12 year-olds, $13 for 7th-9th graders, to $14 for 10th grade and up. For a few years there was a charge for Family Camp of $2.50 per day for adults and $1.25 for children under 8 years-old. Preschoolers were free. Insurance costs were 15 cents per day. In the 60’s, a family picnic still officially launched the summer camping program during the first part of July. It was held on July 4th. The day began at 10 a.m. and ended at 4 p.m. after a day of recreation, enjoying a cooperative picnic, Christian fellowship and afternoon service on the camp grounds. In 1962, the camp brochures (as the brochures of today) stated that campers could have a FREE WEEK at camp by bringing three new campers. Cost of attending camp in 1962 had gone up $1. In 1970, the first Early Family Camp was held. Attendance was only fair for the first couple of year, then increased until usually all the cabins were occupied and quite a few trailers were on the grounds. In 1981, camps 6th grade and down cost $34.00 and 7th grade and up cost $36.00. In 1982, there was one price for all camps of $40.00. In 1983, it increased to $56, but in 1985, it had gone down to $52. Pastors’ Retreat was added again this year. 1986 was the year of the first Ladies Retreat, organized by the wives of the Board Members at that time. This was also the year that “Married Couples Retreat,” “Staff and Dean’s Retreat, “Senior Citizen’s Retreat,” “Men’s’ Retreat,” a “Cookout and Musical Extravaganza Evening,” and “Winter Youth Retreats” were added. In 1987, the cost was $57, and in 1990 – $65 and in 1991 – $80. A short “Beginner’s Camp was tried in 1991 for children entering 1st and 2nd grades next fall. The response was so unbelievable and has since become a part of the camping program at EIBC. $90 was the cost of attending camp in 1992 – ($35 for Beginners.) This was also the year that 48 hours with the “Guys’ Retreat” (for hunters) was added in the fall. Cost for a week at camp as this history was being written in 1994, in our 50th year of ministry, is now $95. In the 90’s, the Long Range Planning Committee of the Camp Board recommended that a staff position of “Program Assistant” be created as the ministry of the camp increases. This became a possibility in 1993 and Kevin Pasion was hired to provide Counselor training and support for the Counselors through the summer, to serve as the Dean for six of the youth camps, and to oversee and coordinate the music. Articles of Incorporation were drawn up and recorded in 1946 with details amended in 1952 and 1969; however, the original doctrinal statement has remained unchanged throughout this time. Yielded-men, women, and youth down through the past 50 years have volunteered thousands and thousands of hours for which they will someday earn eternal rewards. East Iowa would have a very difficult time surviving without these volunteers. It has been volunteers who have built everything on the camp grounds. Volunteers share the money God has entrusted to them to purchase materials, finance programs, etc. · 1965 – New blond cupboards were built and installed. A group of 14 women volunteered services on the wood resurfacing. 18 youth of the Iowa county Singspiration spent a Saturday afternoon picking up fallen tree limbs, felled by storms, Volunteers sawed up felled trees and rebuilt a cabin badly damaged by the storms. · 1972 – Volunteers modernized the cook’s cabin, did extensive underground wiring to the 17 cabins, interior and exterior painting of the chapel, and erected new cabins. · 1973 – Two new steel paddle boats were constructed and donated. Women cooked and froze dozens of chickens for meals. Others would go from one farm to the next collecting rhubarb and gooseberries for yummy deserts. Folks around the area planted extra sweet corn, tomatoes, cucumbers, etc., and hauled in in during the camping season. · When Dutch Elm Disease destroyed so many of the beautiful old trees here in 1966, it was again volunteers who helped clear them and replace them with about 50 new trees. Each season men, women and the kids come to spruce up the grounds, clean and scrub cabins, clean out and repair the swimming pool, paint, etc., so the facilities will be ready for the camping season. Others donated their skills helping with craft programs, volunteering a week to serve as a Bible teacher, Dean, missionary, etc., handling publicity, publishing East Iowa Bible Camp Echoes, serving in the book store, registering campers, serving on the camp board, taking care of the camp’s finances, organizing retreats, lending nursing, electrical plumbing, etc. skills, providing equipment for projects, helping with mailing … and the list goes on and on. For many years, even the Camp Manager position was a volunteer one. The craft crew is an amazing group. Their planning and preparation begins during the winter, and then four days during each camping season for the youth camps they come and spend the afternoon loving the campers and showing them how to make the items they want. Many of these dear saints have already celebrated their 70th birthdays, some even their 90th. What an example to younger generations on laboring for the Lord. In 1956, four acres of land adjoining the camp grounds on the north were given to the camp by Mr. Virgil Grimm for an artificial lake, officially known as Lake Warren. During the following three years, the land was cleared of trees and stumps; and earthen dam was put in by bulldozer; over 150 tons of sand was hauled to make a bathing beach, and a boat dock, floating dock, and life guard stand were built. “During the 1956 and 1957 seasons, there was a water shortage in the camp, and Virgil Grimm hauled water daily so the camp could operate. This was a great chore.” A deep well, 712 feet with 5 ½ casing, was completed in 1957 at a cost of about $2500.00 This was much more than the expected cost, but God answered prayers and it was paid for in a year or so. Quality of the water became a problem in the 80’s and in 1990, the camp hooked up to the rural water system. In 1965, there were still a few free weeks out of the summer when the camp was not in use and at these times other groups such as Youth for Christ, the Mennonite churches, and Iowa County’s special needs children used the facilities. The camp grounds were extended once again in 1966 by acquiring two acres on the east, which provided more room for recreation and space for campers and trailers to park. 1966 was also the year a new bath house was begun, and the year that scores of large Elm trees were lost to disease. All of these had to be removed and new ones planted. It was also the year that electric wires had to be buried. Whew, what a year! Algae became a real problem in the pond making it unsatisfactory for swimming. In 1969, to the tune of $18,000.00, a new swimming pool was constructed with mostly volunteer labor. In 1976, the need for a new chapel, dining hall, and kitchen to accommodate the increasing number of campers was evident and a construction fund was established. The camp board felt strongly about not borrowing any funds for this, but to wait upon the Lord to supply the money and volunteer labor. As always, He did. In the fall of 1979, the fund had grown sufficiently to have the foundation of the building poured. As soon as the corn was harvested, carpenters were recruited for a building bee, and the women of Community Church provided noon meals. Pastor Curt Brouwer was hired to supervise the work. Once again, as in the beginning, the Lord provided good weather until the building was completely enclosed around Christmas time. In the spring, the contractor returned and the basement floor was poured. Volunteers came from all over to paint, do the electrical work, and finish the interior. It was completed in 1981 and named the Newton Building, in honor of Royce and Alice Newton, who gave 11 years of volunteer service as camp directors. This new building housed the chapel, new kitchen, dining hall, restrooms, storage and offices. The wrap around deck provided a beautiful panoramic view of the pond, its wildlife, the camp grounds, and the surrounding fields. In 1990, a donation of an air conditioner made it possible to cool the upstairs. A little later, the dining hall was air conditioned. Camping was changing. Gone were those warm days and evenings when the temperatures at times climbed to 101 degrees and higher, when each counselor carried from cabin to chapel a fan for their row of campers, and the days when Deans built many hours of swimming time into their schedules to cool those campers off. Following the completion of the Newton Building, extensive remodeling was done in the old chapel and dining hall which would now be known as Founder’s Hall, in honor of all those who had prayed, gave, and labored in those early days to see East Iowa Bible Camp become a reality. A plaque in the hallway lists the names of Ivan Day, E. Lester Elam, Chester Erteld, Edward Gorsch, Clarence Grimm, Frances Grimm, LaVerne Grimm, Raymond Grimm, Virgil Grimm, Orville Horras, Donald Ochs, Darrell Rhodes, Walter Sanford, Alfred Apain, Ellis Wilhite, Sherman Wilhite, Alfred Wyant, and Gerald Wyant. This building was winterized, thus greatly extending the possibilities of the camping program, and created more dormitory space, a lounge area, nursery, showers and restrooms, and a room for children’s sessions during family camp and crafts during the youth camps. Due to other donations, air-conditioning was installed by volunteers in the spring of 1994. By 1987, “The Hilton” (Camp Manager’s mobile home) was aging and developing considerable problems. Life was no longer Hilton quality in “The Hilton.” A fund was established to build a camp manager’s home. Once again it was decided when the Lord provided the funds, the building would proceed. The Lord did, and the volunteers came and had a great time working and fellowshipping together. The ladies cooked meals many times on short notice, for it was never known from day to day how many there would be. On June 20, 1990, after the evening session, many of the camp’s supporters gathered at the driveway “to thank God for the quality building He has provided through his faithfulness, and to dedicate it to Him, for His use.” An open house had been held earlier that afternoon. During the winter of 1992, a new maintenance building was built which provided much needed area for the storage of mowers, camp maintenance equipment, etc. It also provided a heated area for the camp manager to work on maintenance projects when necessary during the winter months. In 1992, EIBC was also given a barn. The Lord provided the funds and moving day came! This was a new situation. The mover recommended that the barn be cut into just below the floor joists of the upper level for the move 10 miles through the countryside. What a sight it was seeing that old red barn moving down the road past farmstead after farmstead, under electrical lines, etc.! Now in its new location on the camp grounds, the hay mound is a gymnasium and the lower level an area for table games like Ping Pong, Air Hockey, or floor games like Shuffleboard. No more do camp Deans suffer headaches wondering what to do with 100+ campers on those rainy Iowa days. Marvin and Jeanne Grimm donated 26 acres of land that borders the camp grounds on the north and east, which the camp took possession and use of on January 1, 1996. Plans were made regarding how to develop this new area, as once again the camp is had run out of space to put cabins for campers. This new land gave the camp some much needed flexibility. Camp brochures from the 1940’s list: Camp Manager – Alfred Wyatt (to be ratified by the Council.) But from then on, Royce Newton served as full-time Volunteer Camp Director. (For six weeks during the summer of 1970, there is no record of any Manager-Director.) Beside the Camp Board, there was a Registrar, Camp Secretary, Camp Dad, Camp Mom, and Deans of each of the weeks of camp. Upon retirement, Royce and his wife, Alice, moved to The Hilton on the camp site for six months out of each of the following 11 years to direct the camp program. In this capacity, he served (as reported in a newspaper clipping by Doris McCartney) as ‘the Unofficial Mayor, Planning Commissioner, Business Manager, Utilities Supervisor, Plumber, Repair Technician, Counselor, Bible teacher, and Public Relations Representative. Besides, as all the kids have learned, he knew where the fattest frogs reside in the small camp pond… important information to know for the weekly races and frog jumping contests.” Alice was in charge of “Housekeeping” at the 17 cabins scattered about the grounds, menu planning, with the kitchen staff, and planning grounds beautification projects.” News clippings in 1979 reported that this would be their last year. Articles in 1980 still spoke of Director Royce Newton. Marlys and Norman Grimm filled in for the summer of 1981, and by 1982 Bob and Doris Blair had taken over the reigns as full-time Camp Director. They also had a long association with the camp, and Bob had served a number of years on the Camp Board. His skills with Collins Radio, Assoc. Professor at Iowa State, and as a vocational counselor, as well as being self-employed in the electrical business were very useful as Camp Director. Dan and Barb Litzkow assumed Camp Director responsibilities from the Blairs until they left in 1987 as missionaries with HCJB. The Lord then provided a replacement for them with John and Barb Cox, with John serving as Camp Manager. John served on the Camp Board a number of years as a Trustee, Board President, and as the Director of other organizations. Few of us probably realize how intense and rewarding these camp stewardship positions are. At times some of these stewards shed tears because camp responsibilities kept them from attending special family occasions, but it all is worth it when reports come of how the Lord has worked in lives. East Iowa Bible Camp is the partial fulfillment of that young preacher’s dream and the farmer’s vision of a camp where “souls would be won to Christ, saints would be edified, and campers encouraged to dedicate their lives for Christian service.” It still is only the beginning.